Create and design professional looking Java Script Menu for your web sites, without writing a single line of code with DHTML Menu Builder, perfect DHTML Menu creation tool for you ! DHTML Menu Builder Create and design professional looking Java script menu for your web sites, without writing a single line of code. No special plugins and no programming or HTML knowledge required, with just DHTML Menu Builder you’ll be able to design, in just a couple of minutes, great looking professional Java script menu for your web site. Worried about compatibility? Worry no more ! 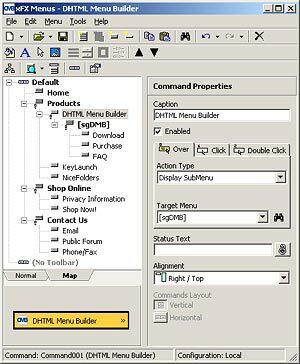 DHTML Menu Builder generated code is 100% compatible with, Internet Explorer 4, 5, 5.5 and 6.0, Netscape Navigator 4, 6 and 7, Opera 7, Safari and Konqueror under Windows, OS/2, Mac and Linux! DHTML Menu Builder offers a very intuitive user interface where all your work is to concentrate in the design of the structure of your java script menu. DHTML Menu Builder even supports font substitutions and embedded fonts. Two images can be placed at both sides of its caption and one at the background. All images support rollover effects. The images at the sides can be resized. DHTML Menu Builder currently supports any type of image also supported by the browsers. Flash Movies are also supported! Apply custom borders with raised, sunken, bevel effects to groups and commands. Unlimited levels. Multiple alignment options are available to display the submenus in any way imaginable. Watch style changes in real time! Let DHTML Menu Builder calculate the best size for your menus based on their contents or manually adjust it to better fit your needs. Support for scrollable menus when the contents of the menus is too long. Actually you can choose from 12 different alignment settings or even use objects on your pages as positioning references. With this special feature you can create very long menus and use the in-menu scrolling capability to scroll through all the menu options. Easy DVD Maker - Convert AVI to MPEG, Copy DVD to VCD, DVD to MPEG, Author DVD and Burning. Hot!